Whiting Corporation is a major manufacturer of heavy-duty overhead cranes and railcar maintenance equipment serving a variety of industries including steel mills, automotive plants, foundries, fossil fuel plants, metal service centers, refuse facilities, hydro-electric plants and nuclear power plants. Whiting Corporation is a trusted name for railcar maintenance and lifting equipment for the freight and commuter railroad industries. 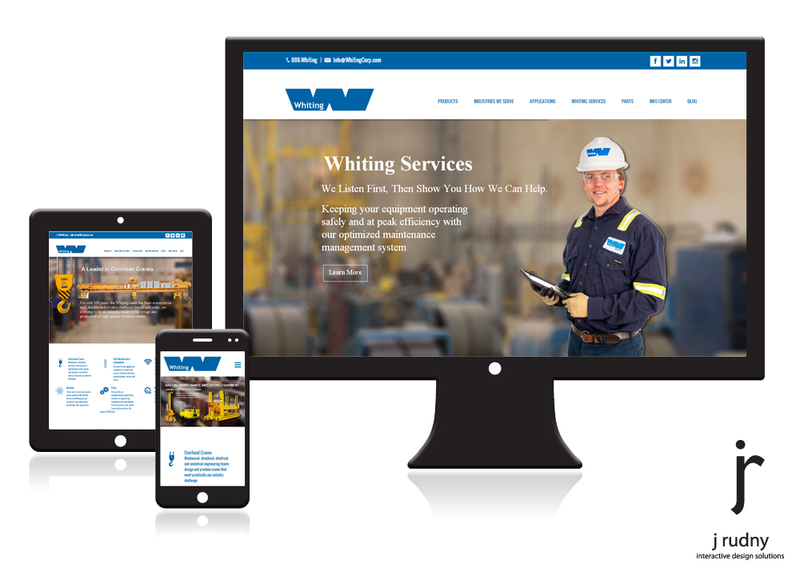 J Rudny was contracted by Whiting Corporation to create a fully responsive site utilizing the WordPress content management system (CMS). The Whiting Corporation project consisted of 3 major stress points that needed to be resolved. The design was outdated and they required more of a visual appeal. The redesign was to have an emphasis on imagery throughout the site that highlighted their products to make it more enticing to prospective clients. There was compatibility issues with the site not displaying well on mobile and tablet devices. Their current site did not provide the staff with the ability to maintain the site properly. They wanted to add a blog to the website so their marketing staff can keep adding fresh content.